Every good stylist knows a thorough consultation requires good listening skills, the ability to ask the right questions and a complete understanding of what the client wants. And at Van Michael salons, it also involves a whole portfolio of photos. Since the salon’s inception 32 years ago, owner Van Council has used images to conduct his consultations and he insists his stylists do the same. Now, with more than seven locations, the portfolio consultation is a requirement for every guest, every visit. “Next to the Van Michael Salon education program, the portfolio consultation is the cornerstone of our brand,” Gregg Colbert, New Talents Director and stylist says. Colbert, who has been with Van Michael 16 years, has been pulling out his portfolio to help guide clients to the right style since the day he started. “We’ve always done it, but over the last 12 years, it has become a major focus and is enforced by management,” he says. 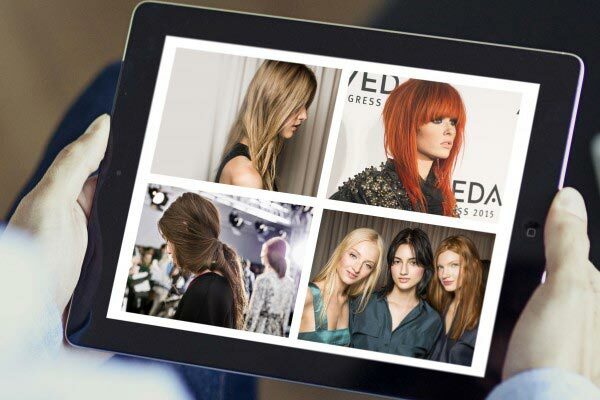 So what exactly is a portfolio and how do Van Michael stylists create and maintain it? For new stylists, Colbert helps them put together a beginners’ portfolio when they are finished with their education. He provides the binder, page protectors and images to get them started. “When they graduate from new talent to the Van Michael salon floor, I let them know they need to get a nicer binder—we recommend leather—and update their portfolio,” Colbert says. The salon does allow the iPad portfolio as well, since many stylists prefer to work digitally, but Colbert stresses the importance of using a hard-back version as well. The salon does advise against using cell phones for images though, as they are simply too small. And if a guest pulls up a photo on her phone, stylists grab their iPads or portfolios to find other images to support the cell phone photo. But ultimately, Colbert says the binder is the tool they want all stylists to use. Once a stylist has his or her portfolio complete, it’s updated twice a year for spring/summer and fall/winter. Colbert says a good example of putting the portfolio to work is with a guest who always wants the same thing. While a guest may not make the change right at that moment, the conversation will make them think about it for a future visit. “The guest thinks, ‘Wow, my stylist was thinking about me before I ever even entered the salon—I must be special to her,’” Colbert says. And for stylists who are trying to achieve better numbers in their benchmarks like retail, add-on services or pre-booking, Colbert encourages them to use their portfolio as a tool for growth. Of course, not all stylists embrace the portfolio consultation concept with open arms at first, but Colbert says the ones who put in the extra effort see results. As for the stylists who would rather rely on the iPad for their images, Colbert acknowledges sometimes it is a great tool. Colbert says using the portfolio can also give the stylist results at the end of the service. The result? Clients have a clear understanding of the style they are signing up for and the stylist can pre-book the next appointment in eight weeks. Doing a portfolio consultation 100 percent of the time is not an easy task for every stylist. So for those struggling, Colbert advises they look to the stylists who are accomplishing what they want to accomplish. During the conversation, he says stylists must think about what they want to happen—rebook more clients? Sell more retail? Add on a conditioning service? All of these things are more easily accomplished with a photo. The result at Van Michael salons? Happier clients and more profitable stylists.